When I left for Viet Nam the first time my mother gave me two things. 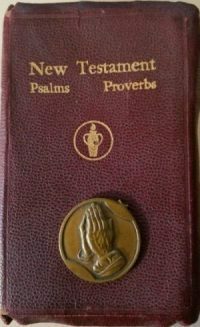 The little New Testament Bible the Gideons gave me at school on November 24, 1959… yes, they came into the classroom and gave each of us one! And the other was a small medallion she had received from Oral Roberts. I carried them with me on every mission I flew during both of my tours but it was only because my mother gave them to me. It wasn’t because I fully understood what they represented; especially the medallion. At some point in our walk with Jesus we all come to that place where we finally accept the fact that it’s one thing to be an obedient servant struggling in our own strength, and something altogether different to be empowered with the energy of the Lord and simply follow Him and do what He asks. I don’t know how long it took me to put that in perspective. The Creator of the universe and everything it holds puts everything into us that we require; He makes all things possible. There isn’t one thing in this world, no obstacle, no culture or no person that can stand in the way of the purpose for which He created us… except ourselves! That was brought home the other day as I was looking through a box and I found both of those items from so long ago. The little Bible with the picture of the flag on the first page with inscription… Righteousness exalteth a nation: but sin is a reproach to any people (Prov 14:34) and the medallion with a pair of hands folded on one side and an inscription on the other: God grant me the serenity to accept the things I cannot change; the courage to change the things I can; and the wisdom to know the difference… Amen. And the note that my mother sent along with these two little items simply said… Let Go, Let God. As I write these thoughts down this morning, some 62 years later I smile at the wisdom of a mother who always faced the trials of life with a simple hope and faith that everything would work itself out. And as I look at that little Bible and medallion on my desk I wonder why it took me so long to finally figure it out? Why didn’t I understand that simple faith my mother had? Why didn’t I understand all those years that the secret to walking through this life with Jesus is so very, very simple? Well, it may have taken me a long time but it has certainly become the foundation of my daily walk with Him. I could support this secret with a vast number of scriptures but I think the words of my mother that were there before every mission and every day of my life will suffice… Let Go, Let God. Tom, Thanks for sharing this aspect of your life journey with us. I say Let Go and Let God quick often myself. We have so much to be grateful for this week and every week. Kevin… sorry for the delay. I didn’t catch the heads up that you had posted. Yes… we so need to let go but sometimes its soooo hard. Blessings my friend.